For the first time in years, the outlook appears to be brighter for songwriters and music publishers to earn higher royalties from the music streaming companies (Spotify, Apple, Amazon, Google and Pandora). In late January (2018), the U.S. Copyright Royalty Board (CRB) issued a written decision that songwriters/publishers shall be paid a mechanical royalty rate that is 43.8% higher than the previous rate. The CRB also decided that songwriters/publishers shall be paid a higher percentage of the total royalties paid to record labels, artists, music publishers and songwriters. The new ratio is 3.8 (for labels & artists) to 1 (for publishers & songwriters), which is a significant improvement. In addition, there’s a new bill called the Music Modernization Act that’s been introduced in the U.S. House of Representative and Senate. The bill is designed to streamline the music licensing process to make it easier for rights holders to get paid when their music is streamed online. Notably, this bill is attracting bipartisan support from both Democrats and Republicans in Congress. 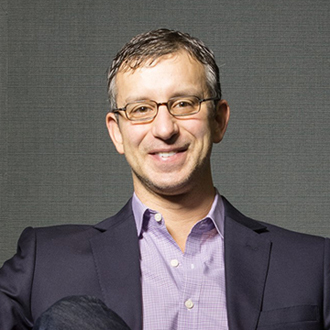 In light of these developments, we thought this would be a good time to speak again with David Israelite, President & CEO of the National Music Publishers Association (NMPA). Israelite has been at the forefront of the fight to secure higher royalties for music publishers & songwriters. Israelite oversaw the trial in Washington, DC on behalf of music publishers and songwriters, where three judges heard arguments from music publishers & songwriters on one side, versus the music streaming companies on the other side. Israelite was also a witness at the trial. In this new interview, Israelite discusses the new CRB ruling, and what the specific ramifications are for songwriters & publishers. He also explains the Music Modernization Act, and the possible timeframe for when this could be passed. Israelite also discusses other issues, including the low royalties that YouTube continues to pay, and the new licensing deals that publishers are negotiating with Facebook. DK: The Copyright Royalty Board recently made a ruling, that songwriters shall be paid a larger percentage of streaming royalties. How did the CRB decide to pay this higher rate? David Israelite: We have to go to trial every five years, in front of the Copyright Royalty Board, to set the rates and terms for Section 115, which basically means mechanical reproductions, which today mostly revolves around interactive streaming companies like Spotify, Apple, Amazon. Google and Pandora. We spent two years in a process of that trial…we ended up conducting a lengthy trial. There were many witnesses that testified. And finally (on January 27, 2018), we got the result from the CRB, and the result was very good for songwriters and music publishers. 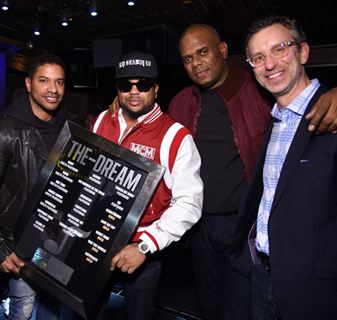 Pictured (l-r): Ryan Press (of Warner/Chappell Music), hit songwriter The-Dream, Jon Platt (CEO of Warner/Chappell), and David Israelite. Going forward, for interactive streaming companies, the streaming companies basically have to pay songwriters the greatest of three, different numbers. The first number is a percentage of their revenue. Currently under the statute, that percentage number is 10.5%. Under the CRB ruling, that number will step up every year for over the next five years, ultimately ending in 15.1%. That’s a 43.8% increase in the topline rate, which is obviously significant. The second test is, we are entitled to a percentage of what these companies pay the record labels. We call that a TCC number, which stands for Total Content Cost. And that number steps up every year, all the way until the last year of the five-year term, to 26.2%. So whatever they pay the record labels, we’re entitled to at least 26.2% of that, and if that number is bigger than the topline percentage number, then we get paid under that number. What’s really significant about that, is that in the current statute, that TCC number is something that is capped, which means once it hits a ceiling it can’t go any higher. And because of that cap, we’ve never really been able to use the TCC category to justify higher payments. But under the new decision there is no cap, which means as high as that TCC number goes, that’s one of our alternate rates that we get paid under. The third test is basically the same per-subscriber minimums that exists in the current statute. Those numbers didn’t go up, which means that the third test probably isn’t going to be very relevant going forward. We are almost certainly going to get paid on the greater of the topline percent of revenue or the percent that the record labels get paid. And what’s really amazing about the result, is that if you look at a comparison between how much the sound recording copyright or the artist/label share, versus the composition copyright or the writer/publisher share, under this last TCC test, 26.2%, that means that the ratio of label to publisher/writer drops all the way down to 3.8 to 1. To put that in perspective, back in the days when we were dealing with physical goods like a CD, the split was closer to 9 to 1. And when we were in the download world, it was also around 9 to 1. And in the streaming world, it’s been in the neighborhood of 5-6 to 1. This now balances out the split of the money to 3.8 to 1, which is still not probably where it should be, but it’s getting us closer to the balance that we think we deserve. And it’s the best balance that it’s ever been in the history of the music industry. So that’s something that we’re really happy about. DK: How did everybody come together and figure out that 26.2% was the right share for writers/publishers? Israelite: Well you have a three-judge panel, and after a several month trial, with dozens and dozens of witnesses and thousands of pages of submissions, the court came out with a 2 to 1 decision. The two judges that were the majority are the ones that decided this would be the rate structure that would become the law. There was a dissent of a third judge that didn’t think it should be this high. What those judges do behind their closed doors, when people read their full opinion which will be coming out, you’ll get some insight into their thinking into what was influential to them. We’re still digesting the regulations which are over 200 pages long. So it’s hard to summarize in a short form exactly what got us to these final numbers, but it was a long, very intense process where at the end of it, at least two of the three judges felt that the songwriter contribution was worth significantly more than we had currently been getting paid. 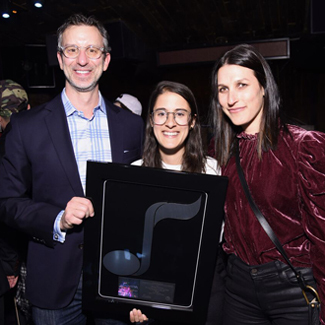 Pictured (l-r): David Israelite, hit songwriter Sarah Aarons, and Amanda Berman-Hill (of Sony/ATV Music). I want to add one more thing—I want your readers to understand, the other side has a right to appeal this decision. And so while we have claimed a major victory with this decision, the fight’s not over. There is a process by which the other side has an opportunity to decide if they want to appeal the decision. So we still have to stay vigilant and be prepared for another fight to protect the decision through an appeal process. The five companies on the other side are Apple, Amazon, Google, Spotify and Pandora. Those five parties have to decide whether they want to appeal the decision. DK: Let’s talk about the Music Modernization Act. It seems to be gaining bipartisan support in Congress. Who started the Music Modernization Act and why does it already have support? Israelite: The Music Modernization Act is addressing something that has been a problem for a long time. Basically, ever since interactive streaming services started, they have had a problem licensing the music from the songwriters & music publishers. In the old days, the business models were fairly simple. If you sold a copy, you had to go get permission from the publisher directly for that mechanical license like an album or a CD. And if you were a radio service, you went to the PROs (performing rights organizations) and got a blanket license for everything they represent, and then you could play anything you wanted on the radio. Those two systems worked very well. When interactive streaming services were developed, they ran into a problem, which is they were trying to license every fractional owner of say, 40 million songs, directly. They didn’t have a blanket solution like like in the radio world, and they weren’t just putting out an album where they could easily figure out who owned every one of the 10 songs on an album. They were trying to figure out who owned every one of the songs in an entire universe in a library. And so this has been a problem, really since the inception of interactive streaming. There was a bill back in 2006 to try to address this. It didn’t pass. There was an effort back in 2011 to address this…it didn’t pass. And what’s happening, is as these streaming services are growing and there’s more and more money involved in what they do, this issue has come to a head. There have been many lawsuits against these services, as people have been watching this unfold. And we entered a moment in time, where I think there was a deal to be made. And the deal came together through the negotiation between NMPA and the digital companies. In this negotiation we said, if we can figure out how to fix your licensing problems, there are things that you can do for us, and we can make a deal. And the Music Modernization Act basically came out of that conversation. The Music Modernization Act really has four major parts. The first part, is we are figuring out how to license these services in the new world. The old models don’t work, and so we are going to create a single-source mechanical license where a digital service can get a blanket coverage for what they want to do, and then they will fund the matching processes that they currently are doing in each of their individual companies. The second part of the bill, is that in exchange for that, they are agreeing to change the way they pay us to give us a better rate standard, so that in a future CRB, we are more likely to get a rate that accomplishes what’s known as a “willing seller, willing buyer” rate standard, meaning, what would happen if we were in a free market? Then with the third and fourth parts, we’re tackling two issues that are important to ASCAP and BMI, with regard to how they go to a judge. Currently, that system is very broken. And what type of evidence they can introduce when they go to a rate trial. 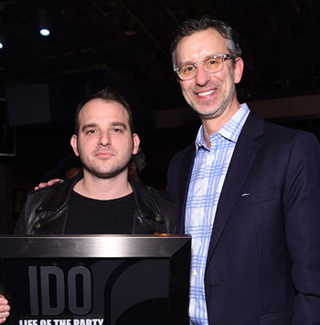 Pictured (l-r): hit songwriter Ido, and David Israelite. So, you take these four parts of the bill: licensing reform, the rate standard, and two issues that help ASCAP and BMI, and we’ve been able to tie them together in one package known as the Music Modernization Act. What’s really significant about it, is the digital companies are paying 100% of the costs, which means that going forward, songwriters will get 100% of the royalties directly to them, with no commissions taken off the top. There will be a database that’s established that is public and transparent. There’ll be a new audit right that we currently don’t have under the law. We will resolve this issue of interactive streaming being both a performance and a mechanical. We currently believe that’s the case, but some digital companies have questioned whether they should be paying twice, and this bill will resolve that they absolutely must do that. So there’s a lot of things in here for songwriters and music publishers, And the thing that the digital companies are getting, is a new licensing scheme that will allow them to avoid these type of lawsuits going forward. DK: What is the outlook on the potential passing of the Music Modernization Act? Could this bill be passed this year? Israelite: Well, we hope it will happen this year. We think that there’s a broad coalition ready to fight for this. You have a very unusual coalition. You have the digital companies, all of the songwriting and publishing and PRO groups, all of the record label and artists groups, all coming together behind one piece of legislation. And the broadcast community has not endorsed it, but said they are neutral and happy to see it pass. So you have a very unusual coalition that’s been pushing for this bill. It’s very hard to pass anything, especially in this environment in Congress. But I think we have a really good shot at passing it this year. DK: In our previous discussions, we talked a lot about the old consent decrees (which have kept ASCAP & BMI from being able to negotiate free market rates for music publishers & songwriters). Does this new legislation override those consent decrees? Or is this still a big issue? Israelite: It’s still a big issue. This bill makes two important changes to the consent decrees. The ones I mentioned about how the judges are assigned to the cases, and how the evidence is introduced at trial. But there are many other issues involving the consent decrees that are still not yet resolved. And I suspect that ASCAP and BMI, along with NMPA, will be launching a new effort to address those other issues, but not through legislation, but rather through a direct conversation with the Justice Department. DK: Another issue that’s been frustrating to publishers & songwriters is that many music fans still just listen to songs on YouTube for free, and YouTube pays very small royalties. Is this YouTube issue addressed in the current bill? Israelite: That issue is not addressed in this bill, but is still a huge problem. The rates that YouTube pays are terrible compared to the paid services. Unfortunately for us, they have the protection of the Digital Millennium Copyright Act (DMCA) to do what they do, and we don’t have a lot of recourse with regard to the law when it comes to how to deal with this problem with YouTube. The best thing that we can do, is by fixing the licensing problem for the paid services, we hopefully will grow the paid subscription part of the market, which will then draw people away from YouTube and into paid subscriptions. And it’s something I think YouTube still has to address, because the entire music community has been very vocal about how disappointed they are in the rates that YouTube pays. So I think our best route is to keep the pressure on YouTube, and to point out the differences in the payments, and try to convince consumers that it’s worth $10 a month to get all the music that they want at their fingertips. DK: I recently read that some music publishing companies have entered into deals directly with Facebook. Can you explain what these deals with Facebook entail? Israelite: Facebook has offered all music publishers, not just some, the opportunity to license music on the site. Facebook isn’t launching a music service per se, but much of what it occurs on the site is music, as their customers post music as part of their own network. And so Facebook has stepped up and decided that it’s going to share a large amount of money with the music publishing & songwriting community, in order to start working together to figure out how to license and identify the music that’s used on the Facebook platform. So what they’ve done is taken a lump sum of money, and they offered to music publishers and songwriters to join them in a process to figure out how this should work best going forward. But in the meantime, to share in a pool of money designated for music. And this is a wonderful step forward—I’m very happy that Facebook, after a long negotiation, has finally taken this step. All music publishers have an opportunity to share in this offer that Facebook is making, and I think it’s building a real partnership with a very important player in the digital music space. DK: Thank you for doing this interview. In closing, with the new CRB ruling and with the Music Modernization Act gaining support, what’s your outlook on songwriters & publishers earning higher royalties? Will more songwriters be able to earn a living in this business? Israelite: I’m very optimistic about the industry right now. I think that we are entering our third year of pure growth in the industry, and that the developments with the CRB decision and the potential of this legislation are only going to add on to that. So I’m very bullish about the industry. Now that doesn’t mean that every songwriter is feeling that same trend. One of the dynamics that’s definitely true, is that in the old days, everybody who got an album cut got paid the same thing when you sold a copy of the album. And we’re now in a singles market where when you stream a single, that single alone gets the revenue source and not every other song on that particular album. So I think that some songwriters are doing better under that system, and other writers are missing out on what used to be a revenue flow, because they happened to have an album cut. And so there’s more money total, but that doesn’t mean that every individual writer is doing as well. What our focus is at NMPA, is not to try to change consumer behavior, because we think that consumers are going to go where they’re going to go. Our focus is maximizing the benefit to writers in whatever models are going to flourish in the marketplace. And so things like the Facebook deal are really important, because as social media and things like Snap and Twitter and Instagram continue to grow and use music, making sure that we’re getting revenue from those sources is what’s going to make up for the fact that fewer people buy things or listen to AM//FM radio. But overall, I think there’s more music being consumed than ever before, there’s more money being paid for songwriters and publishers than during the decline period that happened for many years when theft was a big issue or people just weren’t buying as much. And so I think the future looks very bright.